The cardinal number equal to 10 to the 36th power. Chiefly British. The cardinal number equal to 10 to the 66th power. LOL… when I was young, a zillion was big! Not anymore. To very briefly explain, currently our internet is ran by IPv4 (Internet Protocal version 4) and because of the development of smart phones, we are literally running out of IP addresses. Each computer, laptop, tablet, phone, etc… anything that accesses the internet must have it’s own unique IP address. Currently IPv4 offers 2 to the 32nd power, or 4,294,967,296 IP’s, to be exact. Meh… considering our National Debt is $15.7 trillion, then 4.2 billion IP’s really is not that much (that is supposed to be humor, just in case it didn’t work). unique IP addresses, to be exact, or 2 to the 128th power. Woah, Nellie! That’s a LOT of digits!!! The difference between the v4 and the v6 that allows such a much larger volume of IP’s is that the v4 is a 32-bit system. And the v6 (I still want to know what happened to v5) is a 128-bit system. Well, like most people, I find the new number of IP’s is a rather overwhelming number – very difficult to actually “visualize.” So I thought I would try to interpret this number in distance so that we may all get a better idea as to what we are looking at here. So away we go! How far to the moon? Well, what about the sun? 90,968,000 miles to sun – when we are closest to the sun. 94,075,000 miles to sun – when we are furthest from the sun. Still, a not even close to the undecillion number we’re looking for in distance. So… inches to the sun? 5,889,679,948,464 inches to sun. I don’t know if that’s closest, furthest or average – doesn’t really matter. Still not near enough digits. We all grew up knowing Pluto as the furthest known planet… oops, wait. It’s no longer a planet. What do they call it now, anyway? 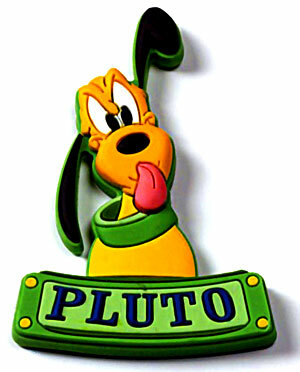 Well, continuing on… We all grew up knowing Pluto as the furthest discovered body of something-or-other from the sun. So most of us can “visualize” or at least relate to this massive distance. So, how far is it to Pluto? It is very roughly 3,667,000,000 miles to Pluto. What? That number still is not even close to enough digits. Inches??? (per my calculations) it’s a lot, but still not large enough. Can you believe that? If you travel in space and drop an IP address behind you every single inch, like a IP-bread-crumb trail, it will take you a trip to Pluto AND back WITH a short side trip to eventually run out of IP addresses. Whew… that was a very long trip. Below are a few charts and the bit comparison for you geeks (I’m a geek and proud of it, dammit). 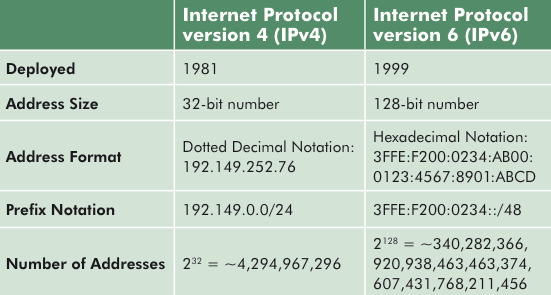 And for those who would like to read about this world transition from IPv4 to IPv6 (where’s v5? ), then check out the article in CNet “Internet powers flip the IPv6 switch (FAQ).” It is very informative. Now, I must go find Mickey and Minnie so we can take a trip with Pluto to Pluto. BTW… what IS Pluto now that it’s not a planet? Meh… it’ll always be a planet to me. That’s what Mrs. Dixson said in 2nd grade and she knew everything! Very important news that you probably don’t care about…..BUT SHOULD!! Thank You Motley News and Photography. Thought of walking to Pluto & back really puts it out there! The growth of technology in the past 2 or 3 decades blows my mind. Holy cow! You’re not kidding there. To think that my phone is a thousand times more powerful than my first computer back in 1992. And probably a million times faster/stronger than the computers we used in high school (graduated 1982). My computer in high school was a number two pencil. LOL… It could have been an abacus… I remember seeing my brothers’ slide rulers laying around. Never knew how to use those. They did, though. That’s pretty overwhelming. Any estimates on how much longer it will be, before the internet’s capacity for IPs is infinite? 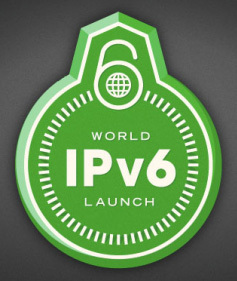 Or is there already a five year plan in place for infinite IP addresses? It can never be “infinite” as there must be some parameters set. But that number looks pretty damn close to “infinite” for me – at least right now. What I’m not sure about is whether IP’s are re-used. Like my old ones, before I moved and before I re-set my computer. Hmmm… have to look that up. I actually knew that it couldn’t be infinite, but similar to what you just said, with a number so vast that it’s on the edge of incomprehensible, it might as well be infinite. 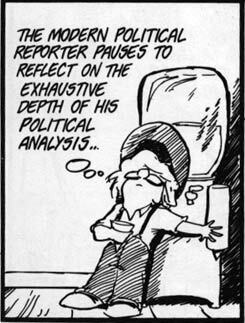 But you did well to put it in perspective with your trip to Pluto. Thanks! When I discovered that even in inches, a trip to Pluto wasn’t near enough, I about gave up. I couldn’t visualize anything past Pluto… stars and such. But that’s more intangible. Then I figured out that a round trip was pretty close in inches and went with that. “IP addresses do get recycled. Each internet service provider usually purchases a block of IP addresses. Which can be a few hundred to thousands (if not more). 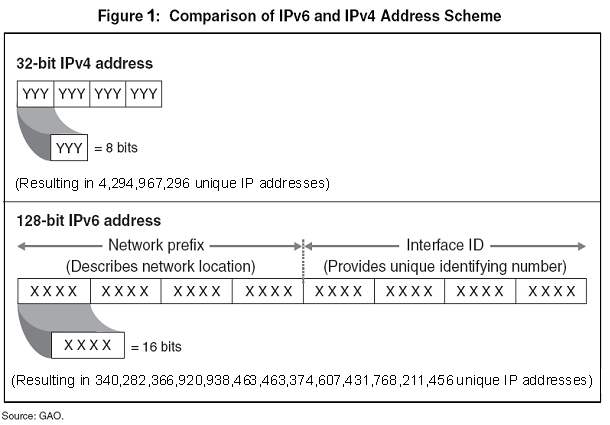 Of this pool of IP addresses, your ISP assigns IPs to computers when they connect. Sometimes a random one from the pool is chosen, other times it’s the lowest IP available that’s assigned. Whenever your computer connects online, your ISP most likely records the time, the fact that it was you who signed on, and the IP address you were given. It seems sensible to recycle IP addresses but all the more astounding that such a vast capacity for IPs is still needed, even with some of them being recycled. Compare the number of IP’s in the v4 to the world population. Then I’m guessing that most people in modern living have two pieces of electronics that access the internet – phone and some sort of computer. Then add in all the business and all the computers in businesses. It starts adding up real quick. LOL… that is very true. And so have I. 1) So WHERE is v5? 2) Pluto is now called an asteroid or something, just flying around in the asteroid belt (I think). 3) I was sad about Pluto’s demotion, but after I got to know Dr Neil DeGrasse Tyson better, I forgave him (but I won’t forget). 4) I wonder if the “word counter” when you write a post goes up to undecillion!?!?!? 5) That would take longer to figure out than it would to travel to Pluto, side trip to Saturn (I really want to fly through the rings), and back home. I still want to know what happened to v5….. The rings would be cool! So there’s the short side trip. What’s your schedule looking like?